Prelude : A steady flame from a brass lamp illuminated the small, dim-lit amphitheatre with its soothing glow. A lingering fragrance of mildly scented incense sticks filled the room. A gentle symphony of the flute, tabla and sitar played in the background. Three plump men took to the centre of the stage. Holding a small mirror in one hand, and a brush in the other, they began painting their faces in green and orange, emphasising the eyes and brows with thick black outlines. A fragile man wearing a ‘mundu’* (supposedly, the make-up Master) perched at a corner with a cup filled with thick white paste, some cloth and a pair of scissors. One of the three artists, conceivably the senior, touched the feet of the Master with due respect and then lay in front of him. With utmost concentration, the Master created a beard by applying the white paste (made of rice and water) on to the layers of cloth strips, then carefully secured it to the artist’s jawline. The Master then swiftly manoeuvred his brush to draw delicate outlines and intricate designs to complete the look. The senior artist had dozed off during the task. After about an hour and a half, the session concluded and the faces disappeared back stage. The Beginning :A large curtain was raised on the podium. Two drummers holding a pair of cane sticks each, secured the Maddalam* and Chenda* around their waists. Kathakali kicked off with the effortless beat of drums. A 60 year old man with his voice as smooth as silk sang verses in core classical ragas with precision. As the tempo gained momentum, the curtains dropped to reveal the main character of the play (in this case, the villain!). He wore a white pleated silk frock that resembled an oversized umbrella around his waist. 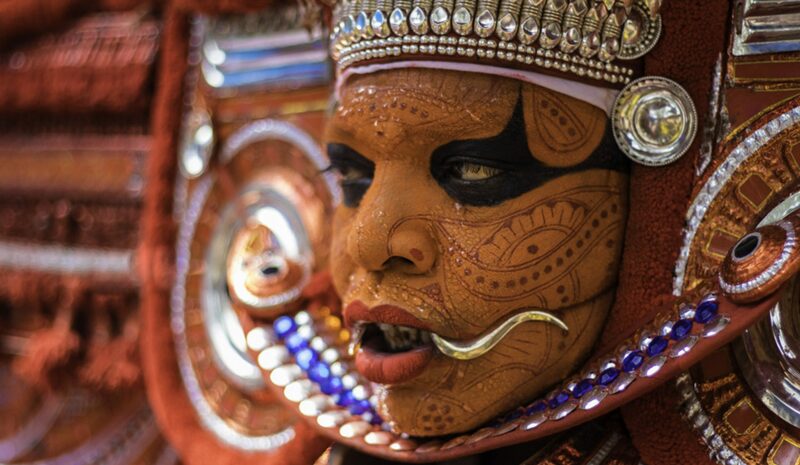 His bare chest hid underneath a canopy of ornaments and his head wore a huge ‘Kireedam’*. I was amused by the long, conical silver nails that he wore and the bronze ghungroos that danced in his feet. His bright green face gleamed with sweat while those red eyes seemed to be oozing blood. The striking make-up perfectly complimented the elaborate and extravagant costume. The character looked so ravishing, that I could barely pull my eyes off! The parody: The ‘Kali’ or story, was based on ‘Keechakavadham’ aka ‘Killing of Keechaka’- an excerpt from the legendary ‘Mahabharata’. Story has it that during their exile, the Pandavas had taken refuge in the kingdom of Virata which was ruled by Keechaka. Here, they had to conceal their identities by assuming various roles. Keechaka was attracted by the beauty Panchali who had taken up the role of a chaperon. He continued his advances despite her resistance. Aggravated by his behaviour, Panchali complains to Bheema, her husband; who had assumed the role of a cook at the palace. Acting as per Bheema’s plan, Panchali invites Keechaka for a secret meeting one night. Assuming it to be Panchali sleeping on the bed, he approaches her, only to find himself in the iron-like clutches of Bheema’s arms who finally chokes Keechaka with his tight grip until he falls dead. The applause : Kathakali had lasted for 90 minutes. With just three characters, it had succeeded in grabbing the nerves of its audience right till the end, metamorphosing into a power-packed dramaturgy of actions, expressions and emotions that changed with every blink of the eye. Panchali had exhibited impeccable feminine shades through her subdued gait and expressions. It was impossible to believe that behind the curtain of her attire, was a man, who with his versatility, could have put any woman to shame! Bheema had done justice to his role with the right balance of love, command and rage. Howveer, Keechaka was the undisputed show-stealer, taking the audience through an unprecedented journey of ego, power, lust, pride, dominance, seduction, failure, pain, surprise and suffering. The demeanor of his gorgeous costume, the agility of his gestures, the ease of his facial movements and his unmatched display of emotions had successfully transported the audience to a by-gone era. My heart had skipped a beat when Keechaka, towards his end, let out a heavy sigh before falling to the ground..
Where : Kerala Kathakali Centre, Fort Kochi. Do’s: Meet and greet the crew backstage. Spread the word. Experience an adrenaline rush with Kalaripayattu (traditional martial art form) performance. Maddalam/Chenda : Percussion instruments used on Kathakali. Maddalam is barrel shaped drum played vertically, while Chenda is cylindrical and played horizontally.